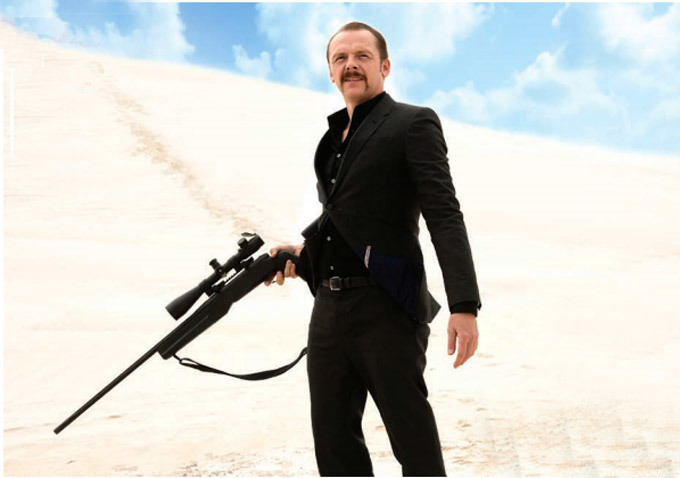 This is your first look at Simon Pegg as an assassin in the movie Kill Me Three Times. The movie also stars Luke Hemsworth, Sullivan Stapleton, Alice Braga, Bryan Brown, Callan Mulvey, and Teresa Palmer . The story follows a singer in a surf town (Braga) who "is the link between three tales of murder, blackmail, and revenge. Pegg plays an assassin hired by the singer’s husband; Stapleton is a gambling addict trying to pay off his debts through a life insurance scam masterminded by Palmer’s small town Lady Macbeth. Brown is a corrupt cop and Hemsworth plays a surfer trying to save Braga from her would-be killer." This is definitely a different role for the actor. What do you think of his look for the movie?